Submitted by Gerry Mascarenhas on November 6, 2007 - 7:12am. You'll were meeting on 10th November..what happened? Is Cyrus Buhariwalla the elder brother of Minoo and Darayus? Where is Santosh Gulwadi? Submitted by Terence de Sousa on November 11, 2007 - 2:06am. Cyrus was unable attend the get-together as he was out of town and was informed byÂ others that Minoo and Darayus were his younger brothers. Although I did mention you to Santosh I was given to understsand that you had already got in touch with him ... so I left it at that! Submitted by Terence de Sousa on November 6, 2007 - 12:00pm. 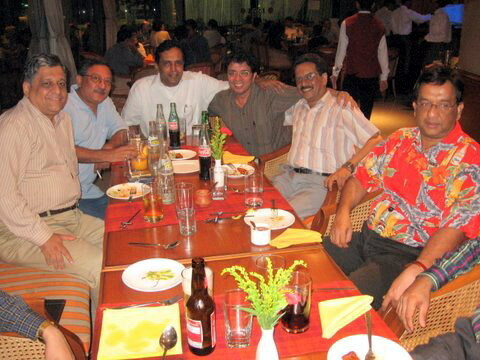 Some of the guys of the Class of '72 had been meeting pretty regularly over the past year or so. I met up with them at the last one, where the Nov 10th reunion was 'schemed'. This is a pic from the last gathering on October 1st. The November 10th get-together is still very much 'on' and hopefully we will see a majorÂ increase in our numbers. Honestly,Â can't recollect Cyrus' siblings ... will check and get back to you. Santosh, I understand,Â will be attending the next get-together and I will be meeting him after 35 years!! Will mention you to him.